Japanese cosmetics brand Shiseido has enlisted Lady Gaga for its 2015 New Year's Ad Campaign, and it's taking an unorthodox approach. WWD reports that on January 1, newspapers across Japan will run ads featuring 46 different shots of her face, with four more to follow on January 5—and all of the images will be selfies. Guess that's a way to cut down on hiring pricy photographers, no? 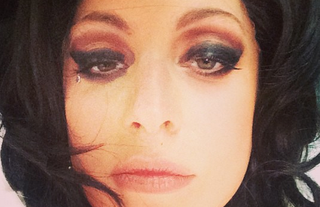 Gaga's not really as rabid a selfie queen as, say, Kim Kardashian, but she does all right. What will be most interesting to see is how her face is done—her beauty looks are consistently more interesting than her clothing, which can be a little try-hard (and has, in the past, pissed off some people in Japan), and she has the make-up sensibility of the best drag queens. Never forget that Inez & Vinoodh look for "Applause."